Home DIY Projects	Fall Decorating-Use what you have! Happy Labor Day, Everyone! I hope it has been a wonderful weekend so far! True to the holiday name, we labored! It was well worth the effort! I finally started my fall decorating! While my husband worked on the master bathroom, I hauled out some of our fall decorations! I’m trying to hold out a few more weeks before I buy most of my pumpkins and mums. I’d like for them to last until Thanksgiving so I’m working with what I have on hand for now. Last week I couldn’t help myself and bought two beautiful yellow mums from the grocery store. I put them in my favorite urn in the kitchen. I added some fall greenery pics and bows. 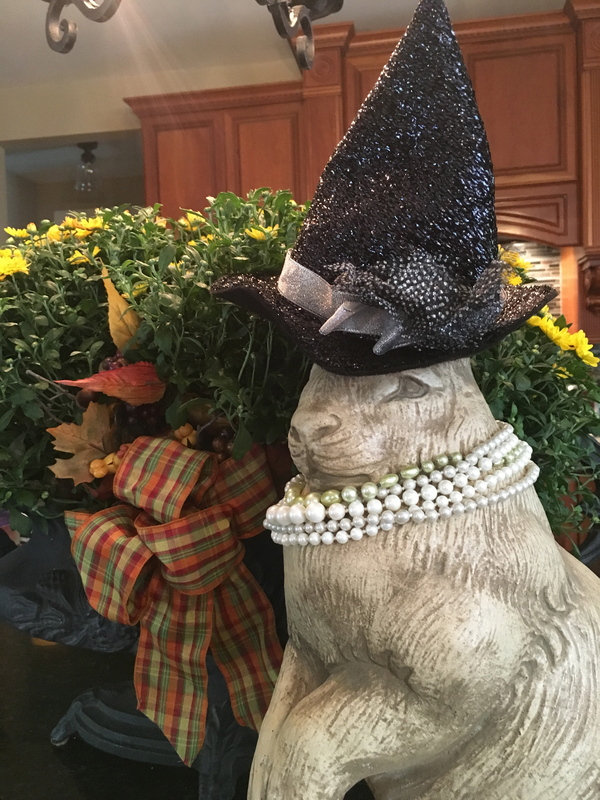 Today, my bunny traded in her tiara for some pearls and her best glittery witch hat. All dressed up and ready for Halloween! She looks perfect next to the yellow mums. I love her. My orange sweater pillows and throws came out of storage along with my metal pumpkins. (The pillows and throws came from Target last year and the pumpkins came from the Hallmark Store.) I cut some hydrangeas from my yard and added them to the pumpkin display. Of course Lacey had to get in on the action. She is my BEST decoration! I cut a few more hydrangeas and put them in a pickle jar with some water and a bow. The little brass squirrels are cute for fall. And I love sunflowers! So beautiful! In a week or so I’ll buy lots of mums, pumpkins and gourds for more fall decor. The cooler weather this weekend is really getting me in the mood for jeans and sweater weather! Hope you all have a wonderful and blessed Labor Day!